For thirteen years, the gates of Bordertown have remained closed, its denizens living on only in the memories of readers, both newcomers and old-timers alike, and the vast assortment of fan groups and websites and more. Now, with the publication of Welcome to Bordertown, those gates have once again been opened. Like any gate to faerie, the passage through is fraught with danger and excitement. Danger in that as you turn the pages, time will pass strangely and you’ll return to the life you once knew somehow changed. Excitement in that Welcome to Bordertown brings together authors from the original series as well as new voices to share their experience of this most beloved place between worlds. And one of those original authors, Ellen Kushner, has joined forces with Holly Black as co-editor of the latest collection of stories and poems to guide us through this haven for outcasts and outsiders, for lovers of all things faerie, and for those of us who live in a Bordertown of our own. Humans are social creatures, and yet so many of us feel as though no matter what we do we will never, ever belong to the human world. 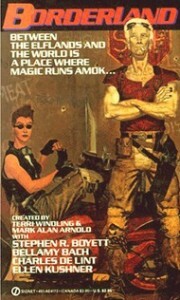 This is no doubt one of the reasons the Borderland series struck such a chord when the first title appeared in 1986. Back then I was a very young mother. The year before I’d had my first daughter (just after I’d turned eighteen), and in August of ’86 my second daughter arrived. Raising a a child (or two) when the rest of the world is still treating you like one is a very alienating experience, but it was by no means the only thing that made me feel like an outsider all of those years ago. I was too busy keeping my own elfin tribe out of trouble to have much time for reading when Borderland first appeared, but when I discovered Life on the Border (1991) a few years later, I realized I was not alone. This was a revelation, for despite Life on the Border and the rest of the Borderland series being labeled as fiction, it is in such fiction that meaningful truths can be found. You see, Bordertown opens its gates to anyone, even young mothers with nowhere else to go. It gives everyone a place to belong. Emma Bull and Will Shetterly are joined in Welcome to Bordertown by Ellen Kushner and Terri Windling, Cory Doctorow (whose story “Shannon’s Law” is available to read on the Tor website here and as a podcast here), Patricia A. McKillip, Catherynne M. Valente, Amal El-Mohtar, Steven Brust, Alaya Dawn Johnson, Jane Yolen, Janni Lee Simner, Sara Ryan (whose story has been gloriously drawn by Dylan Meconis) , Tim Pratt, Annette Curtis Klause, Nalo Hopkinson, Delia Sherman, Christopher Barzak, Holly Black and Cassandra Clare, Neil Gamain, and Charles de Lint: all names you should recognize and whose work is eternally suffused with faerie. We also get two introductions: one by Holly Black and one by Terri Windling, who lead us gracefully across the Border and away. There’s even a “Letter from the Diggers”! All mortals see the Border differently. With my notebook, my pen, my most interested smile. Believing is what I do. In Trader’s Heaven, Elftown, Gryphon Park. Recording is what I do. The natives and the neighbors. I make graphs, note patterns. The lives of elves are long. Are empty again by lunch. Like a mirror in a fun house. As moon shadow and light. Laughed at the other’s cries. Pulled off their staring eyes. And mocked her mother’s guiding. And helped her mother cook. Of wine and sweat and smoke. Crept to bed as others woke. And no to all their hope. Let them curse and mope. True in word and kiss. The beauty he would miss. Ablaze in the other’s heart. They knew they’d never part. Like pearls in the wedding gown. Her cake thrown upside down. You have all I have and more. Forged in a special hell. “No sister of mine are you,” she said. “No mother did we share. Then left without a care. That map the human heart. Tipping the earth from her shoe. Now that we’ve shared these two exemplary poems with you, we’d like to withdraw from the work inside and turn our attention to one of the women responsible for gathering these delights into Welcome to Bordertown. Ellen Kushner has been a mainstay of the Bordertown series since Borderland was published in 1986. First she gave us “Charis”, then, with Bellamy Bach, “Mockery” (in Bordertown, also 1986), then “Lost in the Mall” (a story in parts appearing in Life on the Border, 1991), and finally “Hot Water: A Bordertown Romance” (in The Essential Bordertown, 1998). I asked Ellen how it feels, as one of the original Borderland authors, to have returned as co-editor of Welcome to Bordertown. Ellen Kushner: I thought being co-editor would be a piece of cake: Y’know, just do what Terri did: ask a bunch of really good writers familiar with Bordertown to write new stories, and stick’em in the book! That’s how it always seemed to work in the past — from the outside (and may I just say here that I’m so glad none of our authors this time was as heart-stoppingly late with their stories as I always used to be? )… Then I discovered just how much work it actually was to answer authors’ questions about the series, and vet their ideas for a sort of emotional accuracy: “Is this really a Bordertown story?” Thank heavens I had Holly at my side — what an amazing reader that girl is! — and, of course, Secret Weapon Terri Windling was waiting in Devon for that day we descended on her en masse with a suitcase full of copyedited mss., and sat ’round a big table together checking all the stories against the original volumes and against each other, making sure the details interwove. I guess you asked how did I feel, and not what did I do — mostly, I felt like Terri had handed me a sacred trust, and I was terribly worried about disappointing her. So I was hugely relieved when she loved the stories as much as we do! I also asked Ellen to share her own insights as to why this series was and is so beloved by so many readers. Ellen Kushner: To be honest, I think some of it has to do with the quality of the writing. Seriously: I had warm memories of the series, but hadn’t actually looked inside their covers in a long time. So it was with some trepidation that I opened the old volumes to re-read in preparation for editing the new one (yes, I’m still the world’s biggest procrastinator! ), kind of prepared to be gently embarrassed at the excesses of our collective youth — and I was genuinely astonished at just how good those stories were! I don’t think you can discount that as part of the equation. The emotional allure of Bordertown has, I think, been eloquently documented in the ARC contests that Terri ran on the new Bordertown website, and Emma Bull’s on her Livejournal. We also wrote a video “mockumentary” on why kids run away to Bordertown! One of my favorite things about Welcome to Bordertown is the dedication one finds inside: “For Terri Windling, who showed us the way to the Border”. Terri Windling created Borderland for teenage readers, but like all things faerie, a reader’s age is a fluid thing and the stories and poems in the series are perfectly timeless. Here I am, in my mid-forties, still finding joy in the shared world Terri ushered into being. Terri has written about the Borderland series here, and about the video “mockumentary” here, and of course we always recommend following Terri’s blog for more information on Bordertown in particular and her creative life in Devon in general. Ellen Kushner and Holly Black also blog extensively about Welcome to Bordertown, and if you do a little searching on the web you’ll uncover post after post about readers’ and writers’ experiences on the Border. Fortunately for us, there is an updated list of wonderful Bordertown posts on the Bordertown Series website. My own experience of life on the Border as a young mother has somewhat shifted. My daughters have grown, and some of them have had children of their own. That keeps me firmly in the place of being looked at askance when people find out that yes, I am a grandmother — still too young to be taken seriously (no matter how much grey hair I have), and yet still, and always, welcome in Bordertown. And you, no matter how strange you feel in this human world, will certainly be welcome there, too. 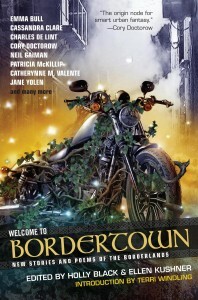 Welcome to Bordertown is available for purchase at Amazon.com, Amazon.co.uk, and The Book Depository, but please check your local independent sellers first.